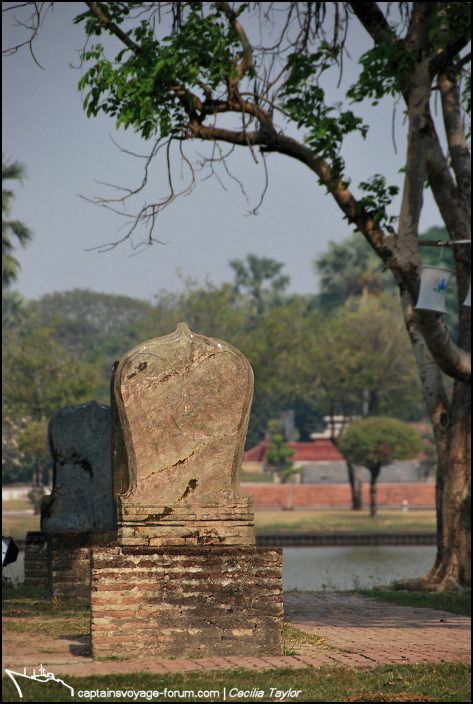 Example of a temple boundary stone. 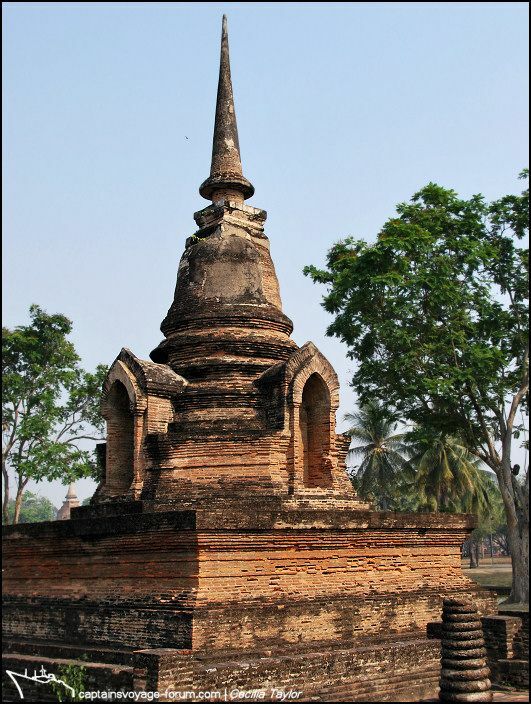 This is the smaller chedi, which can be seen in front of the main chedi in line with the bridge in the first photo. 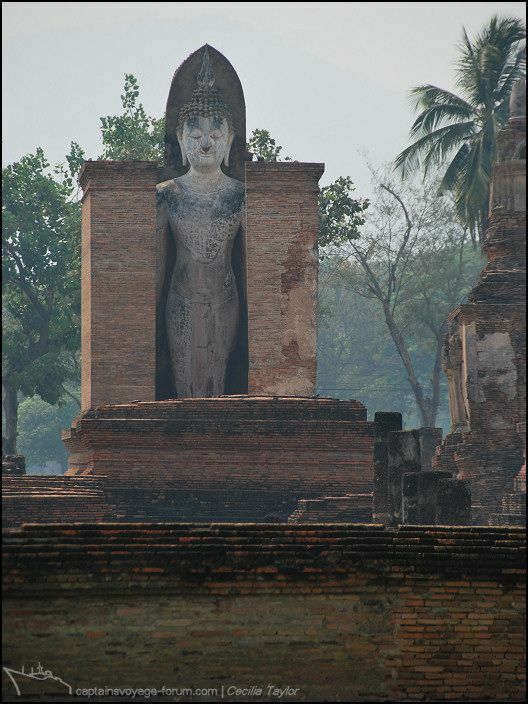 Pakarang has a beautiful panorama of Wat Sa Sri as his second image in the first post of this thread. 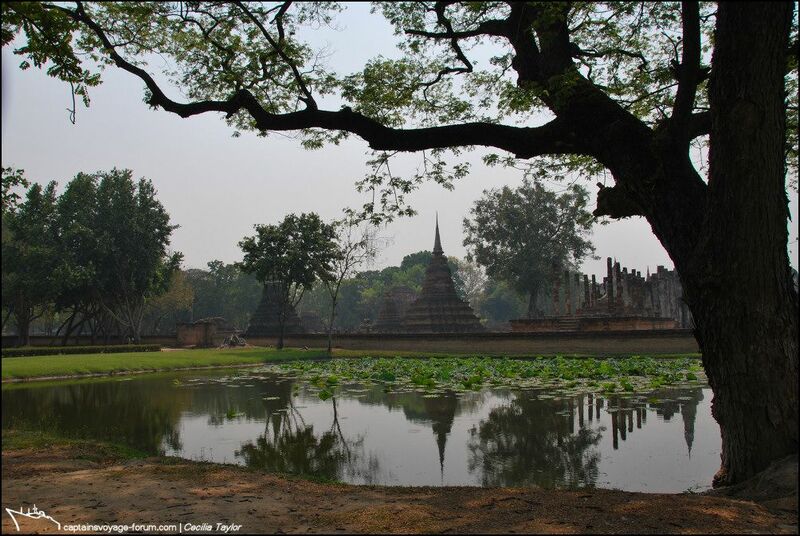 It is taken across the water of another of the many ponds that grace the surroundings of the temples in the Historical Park. 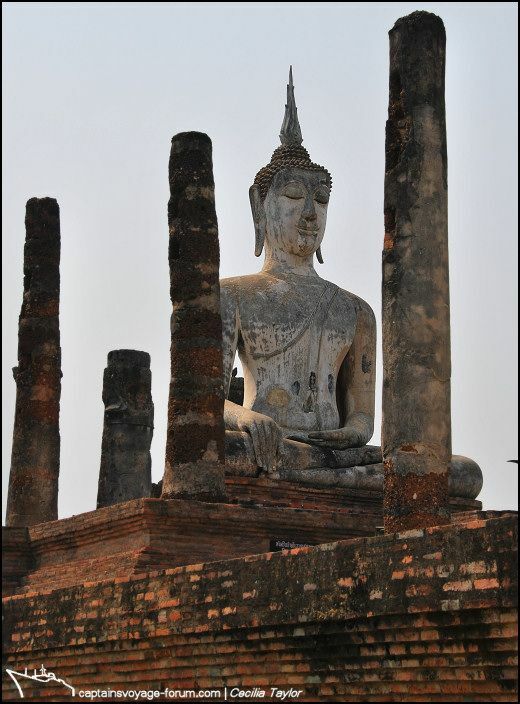 Looking at these new posts, I can't wait to get back to Thailand in 2013! 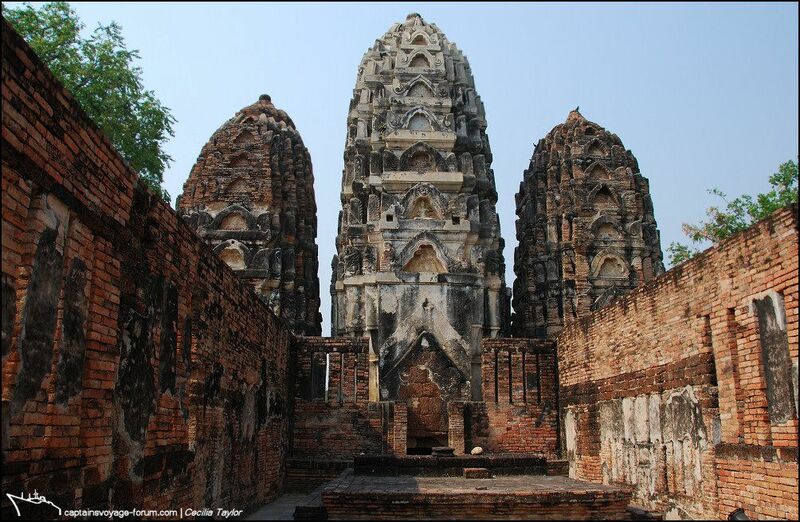 This place is different from its immediate neighbours – it’s situated a little way south of Wat Mahahat, the major temple in the central zone of the Historical Park which I have still to show you. 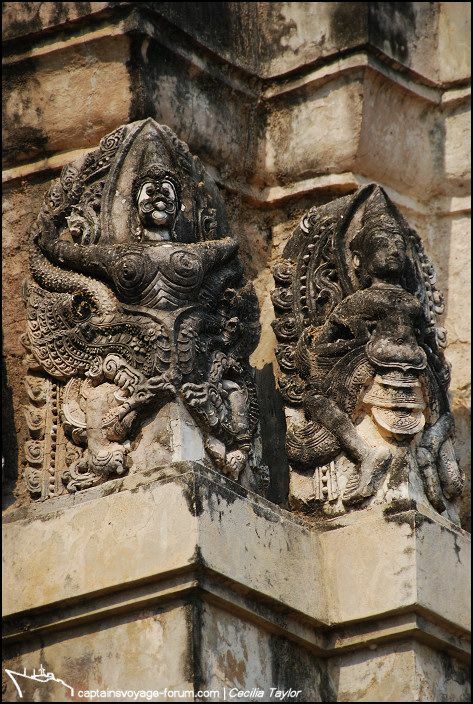 The difference is that it’s in the Khmer style and probably pre-dates them. 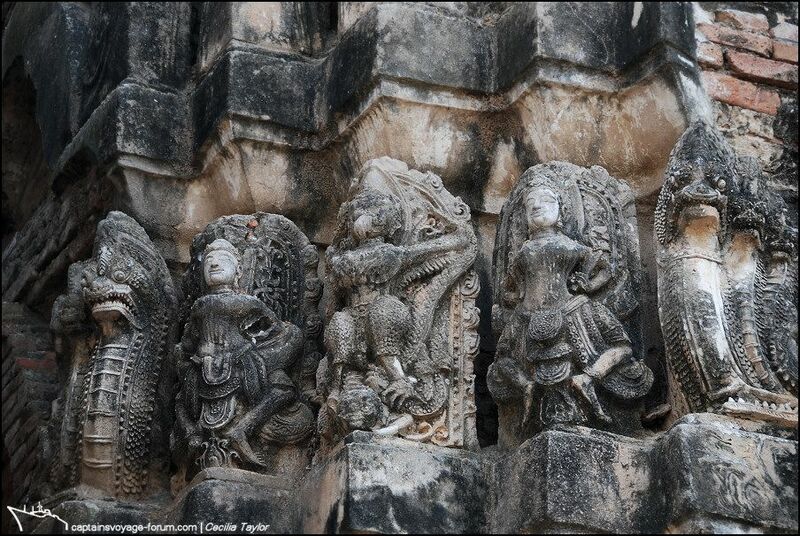 It was most likely a Hindu shrine originally, for the three prangs are intricately decorated with figures depicting both Hindu and Buddhist mythology. 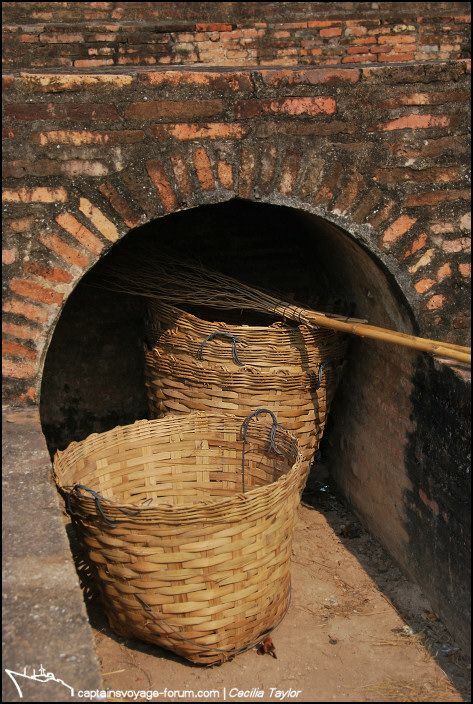 It could even date from as early as the 12th century. 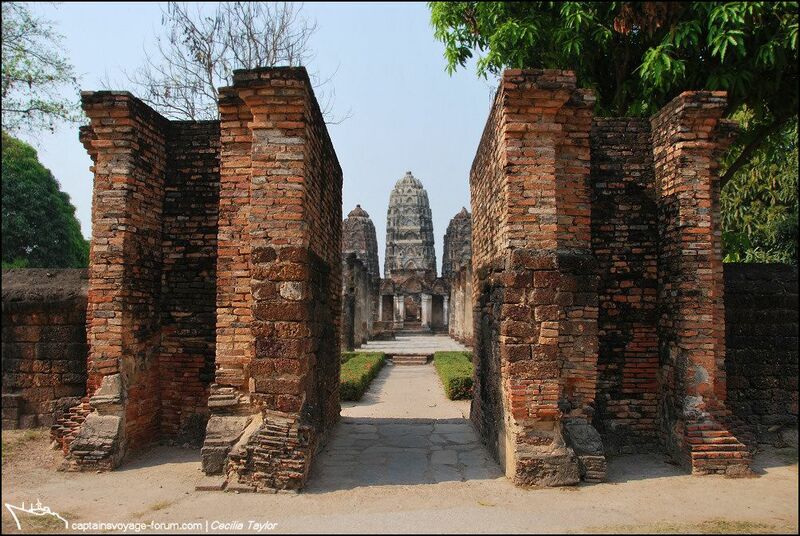 My photos couldn’t possibly compare with pakarang’s sensitive and idyllically calming image (#4/2), taken from the far side of the ruins. Looking at this yet again as I write, I want to return, catch other angles, other moods and times of day and subtleties of light. I was here only on a quick guided tour, but approaching the temple in the way most people do. But it is an impressive approach none the less, and I remember feeling this, and asking the guide to pause as I took the first three photographs. 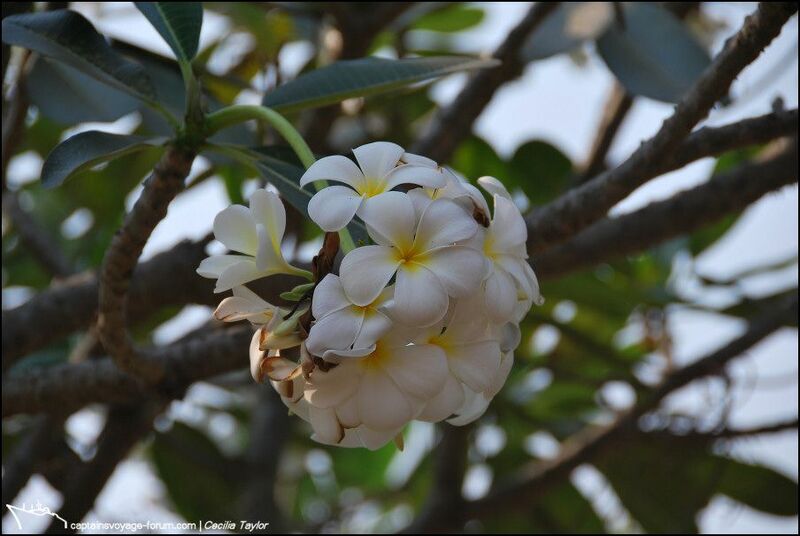 I hope they convey something of that feeling of entering and of walking with me. 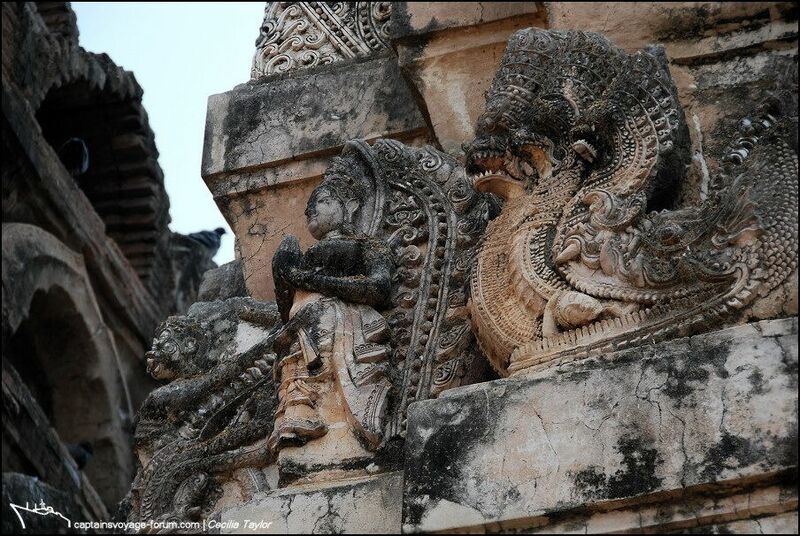 So now some details of the carvings. 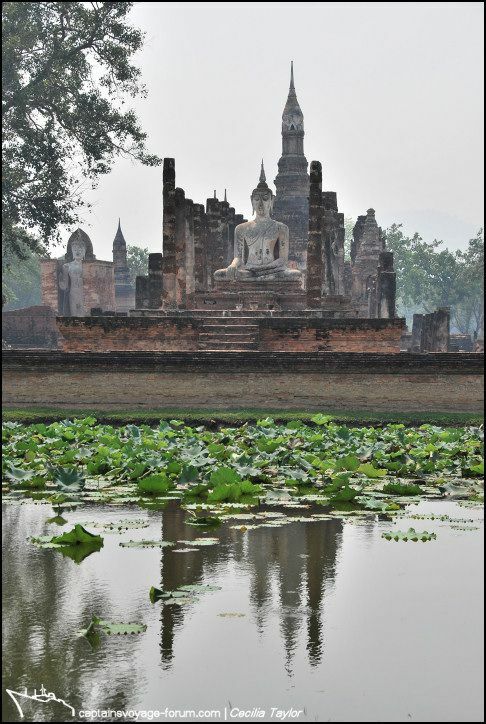 And so I have one further set of photos left to show you in this thread, those of Wat Mahathat, which lies at the heart of the Old City and has been described in many a guidebook as having been “the spiritual centre of the Sukhothai Kingdom”. Ideally I should zoom in on the map of post #154, into that quite large and slightly irregular-shaped square of roads and paths surrounding my arrow-marker, and on the resulting enlargement indicate the exact location of the many monuments and views in the following photographs. 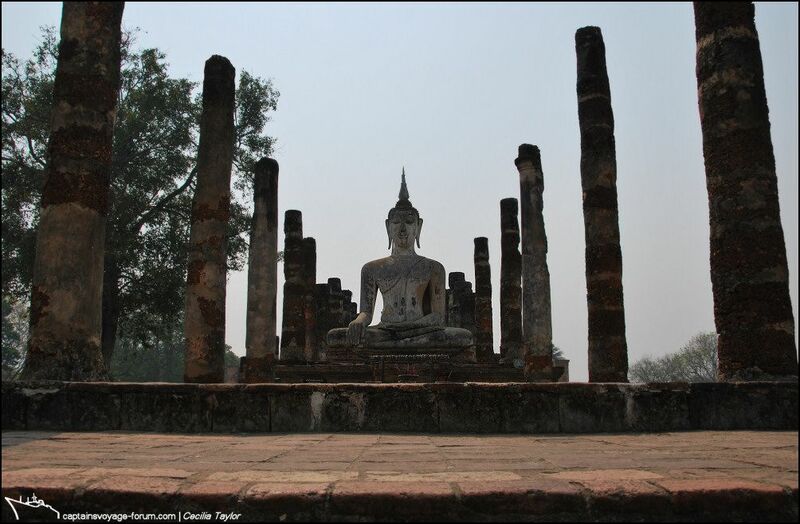 I’m sure I’d be able to do this had I returned that last day in Sukhothai in 2011. But as it is, the photos from 2010 take a little too much disentangling and that’s actually because the guide and driver were so good to me! 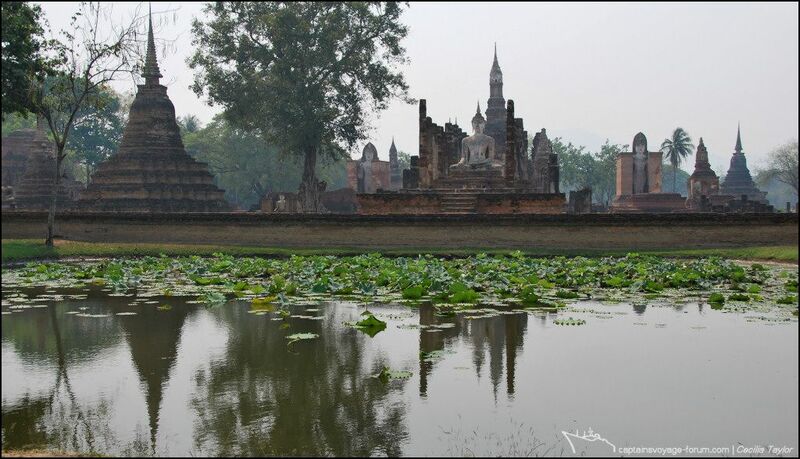 As we drove into the old city, we would often pause for a quick photo stop here and there, perhaps a view of the chedis of Wat Mahathat reflected in the calm water of some moat or lotus pond, or glimpsed in the far distance beyond trees and other temples. 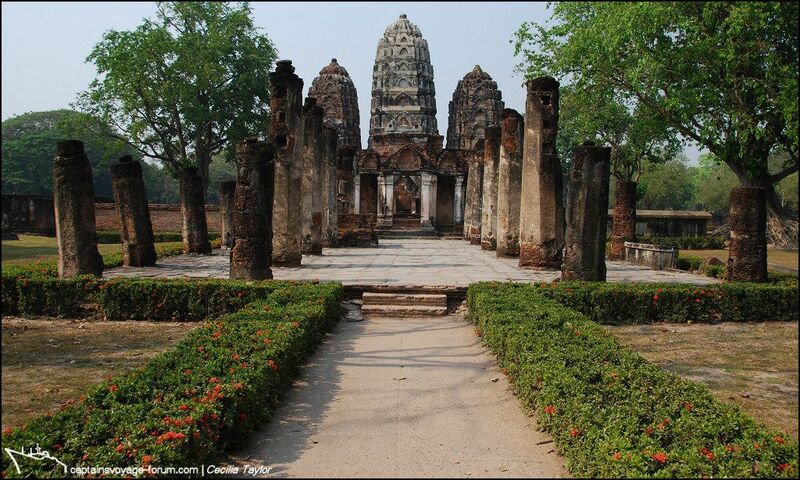 Later I walked with my guide, a “highlights” walk of Wat Mahathat I suppose …some to be photographed yet again in my “on-own time” afterwards, along with other details and views that caught my eye. 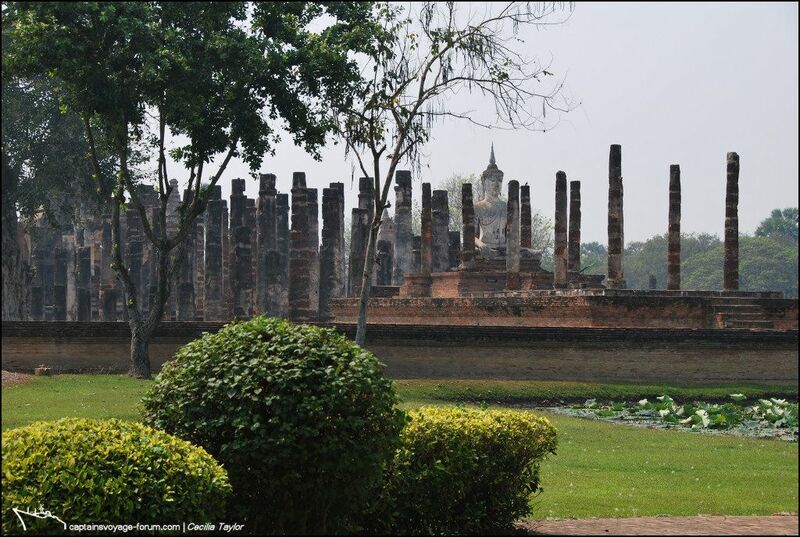 There is something so “me” about the Historical Park at Sukhothai that somehow feeds this desire to see everything, to make marks on maps –perhaps it reminds me of my long-ago childhood-invented cities and landscapes, in which water too was always a part – places not only in my imagination but in maps and drawings and models, those physical remains which have not survived decades, unlike Sukhothai’s centuries. Nevertheless I haven’t yet embraced GPS positioning –well that must wait till my current camera has to be replaced I suppose – though I delighted in many a Gowalla check-in via iPad in 2011, not knowing then that Gowalla would not be around one year later. This is perhaps a suitable moment to urge caution if you are inclined to view Google Earth with all those clickable photo symbols turned on. Whether from earlier days of considerably less accurate GPS positioning on mobile phones, peoples confusion as to where they were when adding captions and names, photos added in retrospect…. well, it is a mess in need of total overhaul. Wow, what a great assignment that would be! Anyway, I shall not risk adding further confusion, so just enjoy the images that will follow here, with probably a minimum of words and captions. 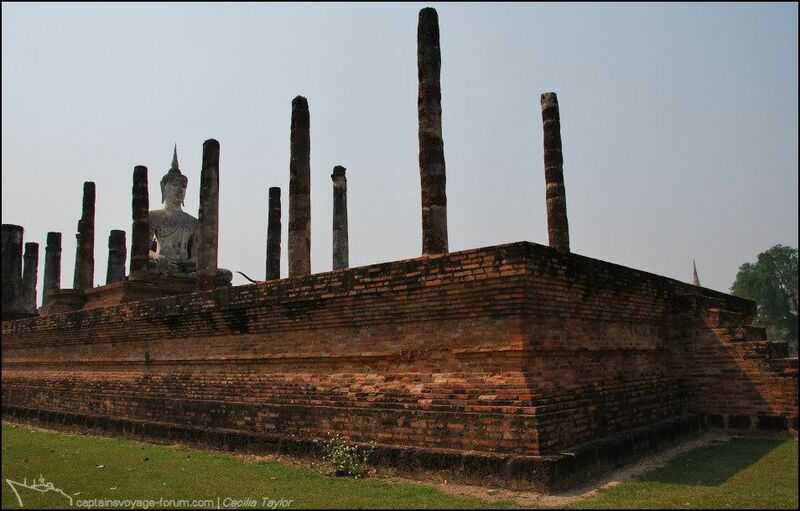 Slightly re-positioning from the previous photos, here is a view towards the magnificent main chedi and seated Buddha of Wat Mahathat. 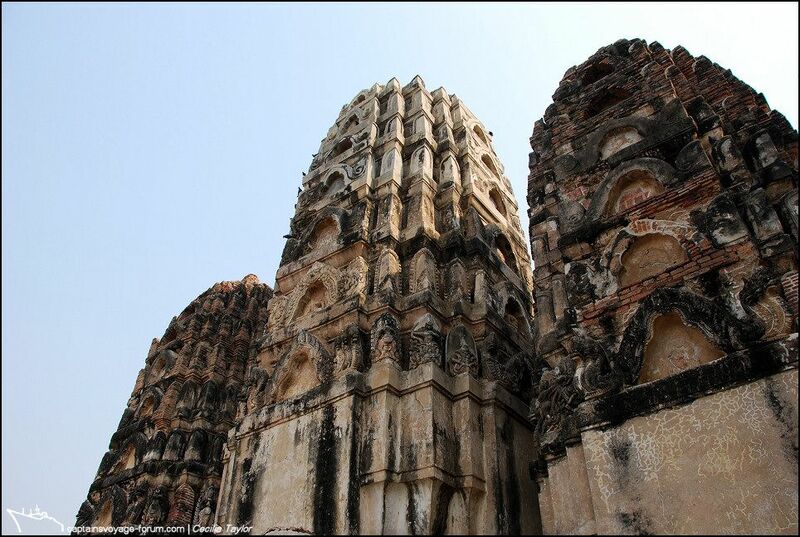 It also shows that flanking the main structures there are two tall (12 metre or so) Buddha figures in a standing posture – Phra Attharot –each within a mondop. 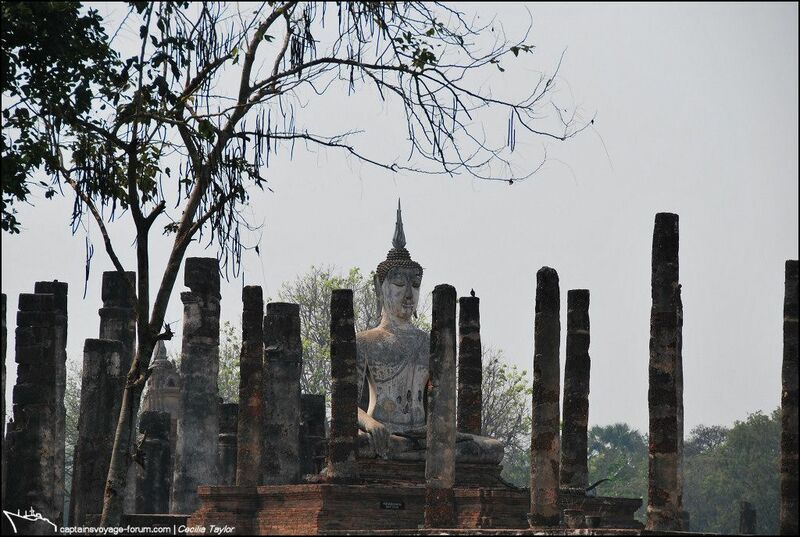 The seated Buddha, seen through the many columns which are remains of prayer halls, faces east as is customary. 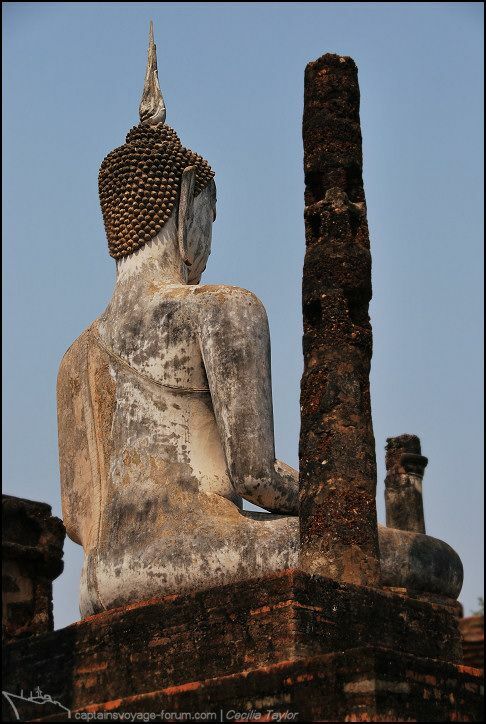 Probably my favourite of the photos I took of this Buddha image, and one that also captures for me the ambience of the Historical Park.